Read the popular tweets by the italian soccer stars. You don't need to be a Twitter account. Performance stats grade the actual Twitter influence of all the teams and best players. Follow the most important Soccer teams in Italy: Juventus FC, AC Milan, AS Roma, FC Internazionale, ACF Fiorentina, SSC Napoli, SS Lazio, Genoa CFC, Udinese Calcio, Parma FC, Calcio Catania, Cagliari Calcio, Bologna FC, Hellas Verona FC, Torino FC, UC Sampdoria, Atalanta BC, AC Chievo Verona, US Sassuolo, AC Siena and more. Retweets and replies are automatically cut, to give more space to words and images. 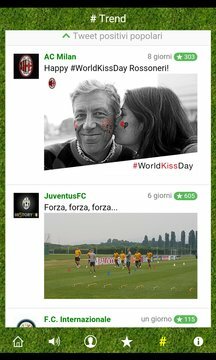 Touch a tweet to share it, touch a team (or soccer player) to read its best tweets.